The HSM Securio C18c Cross Cut office shredder offers a perfect solution to your office's shredding needs. Designed to accomondate multiple users in a single office or department, this office shredder allows you to keep working while keeping your personal and business information safe. 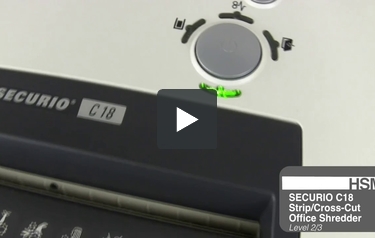 Capable of shredding up to 10 - 11 sheets of paper at once into 3.9 x 30 mm level 3 security cross, the HSM C18c shredder easily handles all of your business needs. Check it out today on MyBinding.com and see how productive your business can be. Welcome to MyBinding video. The SECURIO line is one of HSM's newest offering and this is the C18. Simple to use, controls on the top, LED lights to give you information, the C18 is a great document shredder for the personal, home or small office. It comes in both strip and cross-cut models and therefore can shred from 10 - 20 sheets of 20-pound paper. Cardstock, laminated items, paperclips, staples, no problem for rollers like this and a motor like this. The strip-cut model can handle CDs and DVDs as well. A built in safety feature is the automatic reverse. It will stop, back it on out if there's a paper jam. There is also a reverse button that you press, hold and back it out manually. The large 9.1 inch mouth opening is great for standard size documents and the folding safety element is the grey area around the opening. Press on it, everything stops. The C18 has a 6.6 gallon bin that sits below the motor. The window on the front allows for timely disposal and depending upon the strip or cross-cut pattern, it shreds at a level 2 or 3 security. And that is the SECURIO C18 by HSM. For more demos, reviews and how to's, check out MyBinding.com. Cutting Size 5/32" x 1" 5/32" x 1" 5/32" x 1" 1/16" x 9/16"